He loved chivalrie, Trout he and honour, fredom and curteisie. Whan that Aprill with his shoures soote The droghte of March hath perced to the roote. And for ther is so gret diversite In Englissh and in writing of oure tonge, So prey I God that non myswrite the, Ne the mysmetre for defaute of tonge. And red wherso thow be, or elles songe, That thow be understonde, God I biseche! Ek gret effect men write in place lite; Th entente is al, and nat the lettres space. For tyme ylost may nought recovered be. O on ere it herde, at tother out it went. For of fortunes sharpe adversitee The worst kynde of in fortune is this, A man to han ben in prosperitee, And it remembren, whan it passed is. Right as an aspes leef she gan to quake. So longe mote ye lyve, and alle proude, Til crowes feet be growen under youre y‘. But love a womman that she woot it nought, And she wol quyte it that thow shalt nat fele; Unknowe, unkist, and lost, that is unsought. That lyf so short, the craft so long to lerne, Th’assay so hard, so sharp the conquerynge. Ful craftier to pley she was Than Athalus, that made the game First of the ches, so was his name. How potent is the fancy! 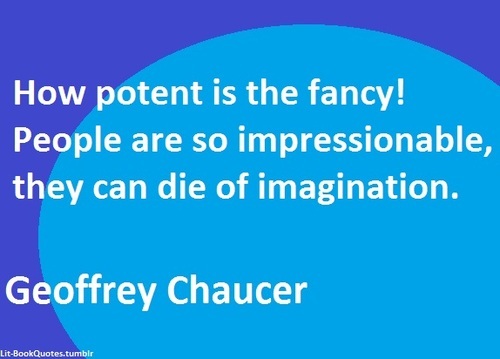 People are so impressionable, they can die of imagination. 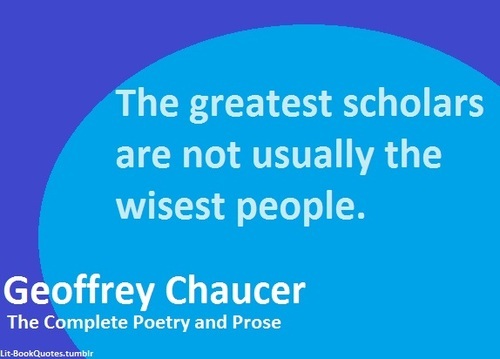 Geoffrey Chaucer, known as the Father of English literature, is widely considered the greatest English poet of the Middle Ages and was the first poet to have been buried in Poet's Corner of Westminster Abbey. While he achieved fame during his lifetime as an author, philosopher, alchemist and astronomer, composing a scientific treatise on the astrolabe for his ten year old son Lewis, Chaucer also maintained an active career in the civil service as a bureaucrat, courtier and diplomat.